(Papers) IBPS PO Exam Paper - 2013 "Held on: 27-10-2013" ::QUANTITATIVE APTITUDE:: | BANK EXAM PORTAL : IBPS, SBI, PO, Clerk, IPPB, Bank Jobs Aspirants Community. DIRECTIONS (Qs. 1-5) : In each of the following questions, a question is followed by information given in three Statements I, II and III. You have to study the question along with the statements and decide the information given in which of the statement(s) is necessary to answer the question. 1. In how many days 10 women can finish the work? II. 10 women and 10 men finish the work in 24/7 days. 2. What is the present age of Sabir? I. The present age of Sabir is half of his father's age. II. After five years the ratio of ages of Sabir and his father is 6 : 11. 3. What is two digit number? III. The digit at unit's place is less than that at ten place by 3. 4. What is the rate of interest Percent per annum? II. Difference between the compound interest and the simple interest earned on a certain amount in two years is ` 400. III. Simple interest earned per annum is ` 2000. 5. What is the cost of flooring the rectangular hall? II. Length of the hall is 48 m and cost of flooring is ` 850 per sq m.
III. Perimeter of the hall is 160 m and cost of flooring is ` 850 per sq m.
6. If the numerator of a fraction is increased by 20% and the denominator is increased by 25%, the fraction obtained is 3/5. What was the original fraction? 7. If the positions of the digits of a two-digit number are interchanged, the number obtained is smaller than the original number by 27. If the digits of the number are in the ratio of 1 : 2, what is the original number? 8. One of the angles of a quadrilateral is thrice the smaller angle of a parallelogram. The respective ratio between the adjacent angles of the parallelogram is 4:5. Remaining three angles of the quadrilateral are in ratio 4 : 11: 9 respectively. What is the sum of the largest and the smallest angles of the quadrilateral? DIRECTIONS (Qs. 10-14) : Study the following table carefully and answer the question given below. 10. Approximately how many people taking a loan from Bank S in the year 2006 were defaulters? 11. 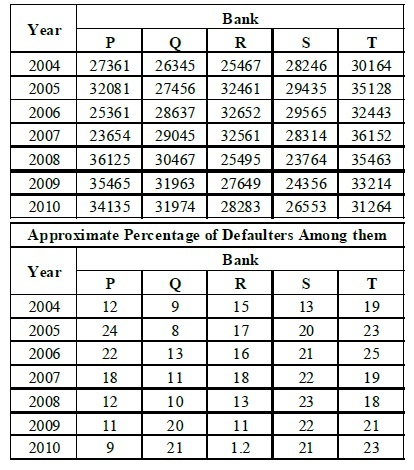 Approximately what was the difference between the number of defaulters of Bank Q in the year 2004 and 2005? 12. In which of the following years was the number of defaulters of Bank R, the maximum among the given years? 13. In which of the following years was the difference in number of people taking loan from Bank P from the previous year the highest? 14. Approximately what was the total number of defaulters of Bank T in the years 2007 and 2008 together? DIRECTIONS (Qs. 15-19) : In the following number series, a wrong number is given. Find out the wrong number. DIRECTIONS (Qs. 20-24) : These questions are based on the following data. The distribution of appeared and qualified aspirants in competitive examination from different States. 20. What is the ratio of the number of appeared aspirants from States C and E together to that of the appeared aspirants from States A and F together? 21. In which state the percentage of qualified aspirants to appeared aspirants is the least? 22. What is the difference in the number of qualified aspirants in states D and G? 24. What is the ratio between number of candidates qualified from States B and D together and the number of candidates appeared from States 'C' respectively? DIRECTIONS (Qs. 25-29) : In the following questions, two equations numbered I and II are given. You have to solve both the equations and give answers. DIRECTIONS (Qs. 30-34) : Study the following table to answer these questions. 30. In various plans in the ratio of expenditure on public sector, which of the following graphs explain best the expenditure on water supply and sanitation? 31. The ratio of public sector expenditure to the expenditure on social services was highest in which plan? 32. In the successive plans in the ratio of public sector expenditure there was a continuous decrease in which sector? 33. 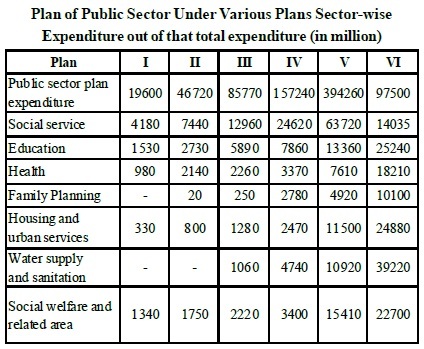 For plan VI out of public sector expenditure, what per cent of expenditure is on Housing and Urban services? 34. For all the given plans, what was the difference in expenditure on education and health? 35. The respective ratio between the present ages of son, mother, father and grandfather is 2 : 7 : 8 : 12. The average age of son and mother is 27 yr. What will be mother's age after 7 yr? 36. In an examination, Raman scored 25 marks less than Rohit. Rohit scored 45 more marks than Sonia. Rohan scored 75 marks which is 10 more than Sonia. Ravi's score is 50 less than, maximum marks of the test. What approximate percentage of marks did Ravi score in the examination, if he gets 34 marks more than Raman? 37. 8 men and 4 women together can complete a piece of work in 6 days. The work done by a man in one day is double the work done by a woman in one day. If 8 men and 4 women started working and after 2 days 4 men left and 4 new women joined, in how many more days will the work be completed? 38. Mr Giridhar spends 50% of his monthly income on household items and out of the remaining he spends 50% on transport, 25% on entertainment, 10% on sports and the remaining amount of ` 900 is saved. What is Mr Giridhar's monthly income? 39. The cost of fencing a circular plot at the rate of `15 per m is ` 3300. What will be the cost of flooring the plot at the rate of ` 100 per sq m? 40. The simple interest accrued on a sum of certain principal in 8 yr at the rate of 13% per year is ` 6500. What would be the compound interest accrued on that principal at the rate of 8% per year in 2 yr? DIRECTIONS (Qs. 41-45) : Study the following information carefully to answer the questions that follow. There are two trains A and B. Both trains have four different types of coaches viz. General coaches, sleeper coaches, first class coaches and AC coaches. In train A, there are total 700 passengers. Train B has 30% more passengers than train A. 20% of the passengers of train A are in general coaches. One-fourth of the total number of passengers of train A are in AC coaches. 23% of the passengers of train A are in sleeper class coaches. Remaining passengers of train A are in first class coaches. Total number of passengers in AC coaches in both the trains together is 480. 30% of the number of passengers of train B is in sleeper class coaches, 10% of the total passengers of train B are in first class coaches. Remaining passengers of train B are in general class coaches. 41. What is the ratio of the number of passengers in first class coaches of train A to the number of passengers in sleeper class coaches of train B? 42. What is the total number of passengers in the general coaches of train A and the AC coaches of train B together? 43. What is the difference between the number of passengers in the AC coaches of train A and total number of passengers in sleeper class coaches and first class coaches together of train B? 44. Total number of passengers in general class coaches in both the trains together is approximately. What percentage of total number of passengers in train B? 45. If cost of per ticket of first class coach ticket is ` 450, what total amount will be generated from first class coaches of train A? DIRECTIONS (Qs. 46-50) : Study the following pie chart carefully to answer the questions. 46. What is the number of men working in the Marketing department? 47. 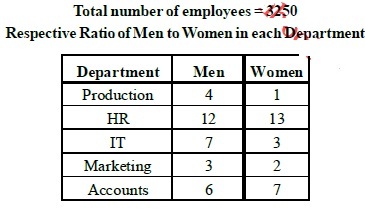 What is the respective ratio of the number of women working in the HR department to the number of men working in the IT department? 48. The number of men working in the production department of the organisation forms what per cent of the total number of employees working in that department? 49. The number of women working in the IT department of the organization forms what per cent of the total number of employees in the organization from all departments together? 50. 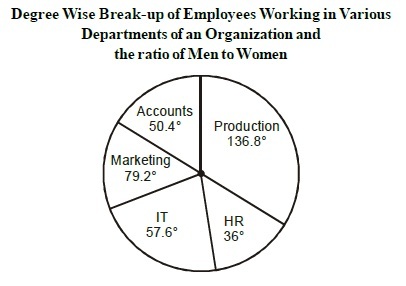 What is the total number of men working in the organization? 1(b). 2(a). 3(e). 4(e). 5(e). 6(e). 7(b). 8(b). 9(d). 10(b). 11(a). 12(c). 13(a). 14(c). 15(e). 16(e). 17(c). 18(d). 19(c). 20(a). 21(e). 22(d). 23(b). 24(c). 25(b). 26(c). 27(a). 28(a). 29(d). 30(a). 31(b). 32(a). 33(d). 34(c). 35(d). 36(b). 37(a). 38(b). 39(a). 40(a). 41(c). 42(d). 43(e). 44(b). 45(c). 46(e). 47(c). 48(e). 49(b). 50(b).